As a total violin family service store, we also stock many fine music books and violin making books. ordered and will often arrive in a day or two. 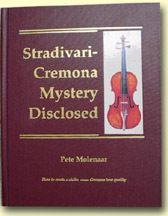 We have several copies of the book, STRADIVARI CREMONA MYSTERY DISCLOSED. in stock. This is a limited, updated and newly revised second edition. The First Edition was sold out several years ago. With the help of Alfred Molenaar, Pete Molenaar's son, we have published this beautiful and very useful book. It will be of great interest to makers, restorers, collectors, dealers and museums. All prices are in Canadian Dollars unless otherwise specified. The violin, viola, cello, upright string bass, duets, trios, quartets, quintets, and ensembles music in all styles. We can order any special requests for you too, or we may have it in our used music. Suzuki Cello Book 1 ZCL-SB257B piano acc. Suzuki Cello Book 2 ZCL-SB264 piano acc. Suzuki Cello Book 3 ZCL-SB265 piano acc. Songs without Words by Mendelssohn ZVN-MENDEL-2 piano acc. 10 Easy Pieces by J. Weiss ZVN-WEISS piano acc. Back Air (G String) ZCL-BACH piano acc. Arabesque by A. Brott ZCL-BROTT piano acc. Salut D'amour by Elgar ZCL-ELGAR piano acc. Berceuse by Armas jarnefelt ZCL-JARNEFELT piano acc. Chanson Villageoise by Popper ZCL-POPPER piano acc. Dreaming (violincello) By Haydn Wood ZCL-WOOD piano acc. How to make and apply classical Italian Oil Varnish from the 1700's, wood primer and varnish colours. Henley's publications at the rear. This is an essential reference work. Clark, A. Mason. Published by Wm Reeves . 120 pages with an additional 28 page catalogue of Books about Music Hard cover with dust jacket. Information for Players Owners, Dealers and Makers of Bow Instruments. Hepworth, William. Published by Wm Reeves . Hard cover. 89 pages. Doring, Ernest. Bound photocopy. 379 pages. Goodkind, Herbert. Violin Iconography of Antonio Stradivari. Excellent, clear B&W photos and information on 700 instruments by Antonio Stradivari. Hardcover. Very useful for identification. Jalovec, Karel. Italian Violin Makers. Dictionary of world violin makers with many photos snd desctiptions. 445 pages. 1958 - revised 1964. Hardcover. Very useful. Hill and Sons. Guarneri Family of Violin Makers. (How to identify.) 1980 Edition. Very useful. Sacconi, Simone F. Secrets of Antonio Stradivari. (for Violin Makers and interested persons.) Italian violin making from 1500-1740. Hardcover. Very important and useful. Hamma, Walter. Italian Violin Makers. 1987, 6th edition. Very useful, clear photos and information. Hardcover. Galamian, Ivan. Principles of Violin Playing and Teaching. Rattray, David. Masterpieces of Italian Violin Making 1620-1850. Excellent information about identification of instruments. 1991 Edition. Hardcover. Petherick, Horace. Joseph Guarnerius (and his master). 1906. 1977 Edition. Interesting. Hardcover. Redford, William. Bows and Bow Makers. 1984 paperback. 80 pages. Very informative for identification of bows. and cellos in The Netherlands, Paris and Canada. The index cross-references important names, concepts and technical terms. Note: Pete's family wanted some colour photos of some of his instruments included at the back of this edition -- these were not in the first edition..
You can receive a copy of this book by phoning Henry or Linda Riedstra with your VISA or MasterCard information. Please include the type of card, number, expiry date, name on the card and the 3-digit permission code on the back of the card. The price of the book and shipping are listed below. If you prefer to send a cheque or money order, or want to make a direct bank deposit, or email transfer we can accept those as well. The price per book is $120 US plus shipping. Shipping will cost between $20 and $50+ depending on where you live, how fast you want the book and what type of courier or mail you would like us to use. We only charge you the amount it costs us for shipping and packing and if you like, we will give you a quote first when you provide your address information. In Canada, residents have to add 5% HST to the cost of the book.